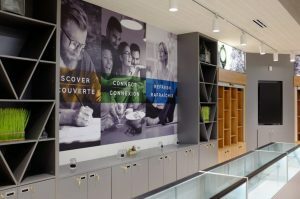 What will Retail Cannabis Stores in Ontario look like? So far the information that has been released for other Provinces and it looks like it will be the same for Ontario. (unfortunately) Even though the Federal Cannabis Act has made it legal to consume, carry, purchase and sell cannabis — within limits, of course — the various provincial and territorial governments have chosen to interpret the provisions of the Act in very different ways. New Brunswick is ahead of the game and had an organised plan for legalisation day. The photo above is from one of their stores. Why couldn’t Ontario have done the same thing. to introduce a special license specifically for marketing cannabis on behalf of a federally licensed producer. These licence holders are called Cannabis representatives in Alberta. On August 13, 2018, the Ontario Government announced that they were scrapping the previous government’s plans for government-run cannabis stores. In its place, Ontario will be licensing private companies to sell recreational cannabis in brick/mortar retail locations, likely similar to Alberta. It was also announced that the Ontario Government will be conducting stakeholder consultations and seeking industry advice around what the Ontario framework should look like. In turn, this is expected to delay brick/mortar cannabis sales until April 2019. From October 17/19 until April, the Ontario Cannabis Store (OCS) will be selling recreational cannabis through its online store ahead of private stores being licensed. Unfortunately the Ontario Government put all their eggs in one basket and opened an online store only. Fraught with website errors, orders being cancelled without customers knowledge and long delays – it has become an embarrassment and also a disaster for medical users. Understandably the demand was high, but so are sites like Amazon and Ebay but they have the experience to handle millions of transactions and can replenish stock faster. We know you can’t grow a plant any faster, but at Weedstock – Cannabis Living in Toronto an exhibitor shared information to me that I was shocked to hear. Many of the Licensed Producers are growing strains which they see as the most profitable rather than what the public demands. 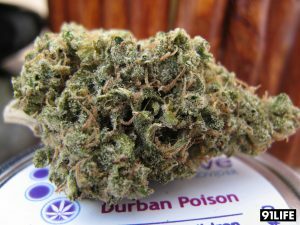 The strain Durban Poison was an example of one strain that many producers will not grow. This 100% sativa can take an average of 9 weeks to grow, yielding an estimated 13 ounces per square meter. This outdoorsy plant likes her space in the great outdoors. Durban Poison can grow up to 90” in height, and produces a yield of an average of 16 ounces per plant. Campbell says he has suffered from chronic pain since surgery he had in 2009. He started by controlling his pain with fentanyl, but disliked it — “Fentanyl scares me. I’m totally scared to death of it.” His doctor switched him to hydromorph contin, and he has been gradually able to cut his dosage by over two-thirds by using cannabis oil, and hopes to cut it further. 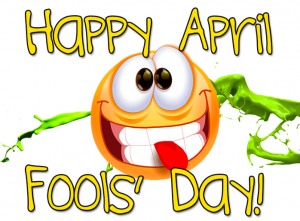 So the JOKE is on us as the Government of Ontario chose to open private retail locations on April 1st, 2019. Ontario was caught with their pants down by only selling online, and not being able to keep up with demand. So instead of the Government running the stores, they become the legal dealers to the private stores. They get the product from Licensed producers and then ship to stores? I can only imagine the cost. Another good reason for Medical patients to get their growing license and learn how to grow. Want more information?